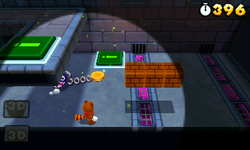 Special 6-3 is the third level of Special 6 in Super Mario 3D Land. It is based off of World 2-2. The player starts off on a platform next to a Flip Panel Switch which leads to another platform near some poison water. In front of the poison water is another Flip Panel Switch and three ? Blocks, the middle one contains a Starman and the far left one contains a Poison Mushroom. Next to this is a small platform with an invisible block on it that contains a Statue Leaf. After this section is another section with a Flip Panel Switch which leads outside and then back inside where there is another Flip Panel Switch which leads to a Warp Pipe. In the final area is a Flip Panel Switch that leads to the Goal Pole. Star Medal 1: In between some Spikes in the outside area. Star Medal 2: Floating on a Snake Block Switch, just before a Warp Pipe. Star Medal 3: In the outside area behind some Brick Blocks.